Costain has won a place as one of BAE Systems’ framework contractors on a £300M programme to redevelop a submarine building site in Barrow-in-Furness, Cumbria. The eight year project will include both new build facilities and the refurbishment of existing infrastructure in preparation for a successor to the Vanguard class of submarine to be constructed at the shipyard. Redevelopment work will commence in early 2015, with Costain set to provide nuclear project delivery on operational sites and deliver the integration of works into existing submarine build programmes. Costain chief executive Andrew Wyllie said: “We have been selected for our expertise in the process, mechanical and electrical delivery of nuclear projects, as well as our reputation for working collaboratively with our customers, other delivery partners and the local community. 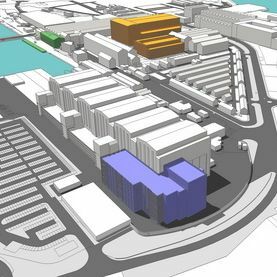 Construction activity at as part of the scheme will include an extension to the Devonshire Dock Hall construction facility to include a new state of the art manufacturing and installation facility. The site’s main fabrication facility will be refurbished while there is also the intention to build a 28,000m2 off site logistics facility, where submarine parts and materials could be stored. At the project’s peak, defence security and aerospace firm BAE Systems is expected to employ approximately 850 contractors. In August this year buildings at the site started to be demolished in preparation for redevelopment, marking the first significant phase of activity in the programme. The site’s old foundry and boiler shop were the first to be demolished. It is expected that more than 90% of materials such as timber, bricks, sandstone and metals will be recycled.